Every year March is the National Craft Month with its own National Crochet week in the middle of it. 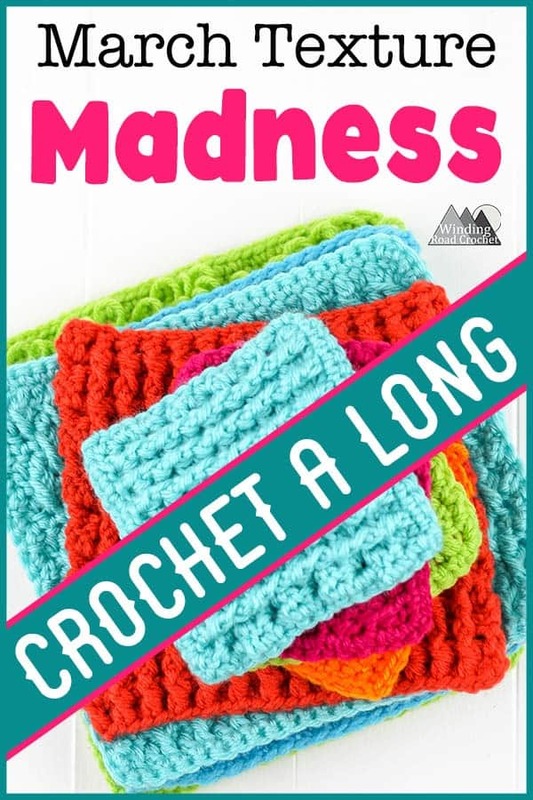 This year I thought we could Celebrate National Craft Month with a March Texture Madness Crochet A Long. Sign up for my Newsletter so you don’t miss any part of the event. This event is all about expanding your crochet skills and learning new, fun and exciting crochet stitches. We will be learning nine heavily texture crochet stitches with left and right handed video tutorials, that will be great for all three of the end projects we will be making. Yes, in this Crochet A Long you will have the option to make one of three projects: a small, medium and large project. Each project will be made using the texture crochet stitch sample swatches that we will be making. I won’t tell you just yet what those three end projects are, but what I will tell you is that they are all baby items that will be great for baby or toddler boys and girls. Also, only the largest project requires all 9 stitch sample swatches. Texture crochet stitches are yarn eaters! This project will be an amazing stash buster. Use a different color for each sample swatch. Babies and toddlers love lots of colors! Below you will find all the materials you need and the schedule for the March Texture Madness . You will also find more information about each end project. Don’t forget to join the Our Crochet Journey Facebook Group to share your progress with the community! Check out some all my Free Crochet Patterns here, or some of my most popular patterns below. This post may contain Affiliate links. For more information refer to my Terms and Conditions. Each size sample swatches will be turned into one of three different baby items. The smallest project will only require 6 of the texture samples swatches. You will also need a small amount of polyfil to complete the construction of this project. Any small child can have fun with this Sensory Block. After making 7-9 medium size samples swatches click the Pattern title above to be taken to the tutorial on how to turn your sample swatches into an adorable sensory book for babies, toddlers and anyone who can benefit from sensory experiences. The largest project will require all 9 of the sample swatches though you could make more and more swatches to add on this this project. Save this post for easy reference to all the Stitch Tutorials and project patterns. Are you joining us for the March Texture Madness? Join my Facebook Group and share your samples with the community at Our Crochet Journey Facebook Group! Want to know what I am making next? Follow me on Instagram @windingroadcrochet to see sneak peeks of what I am up to and to be notified of when I release new free patterns. You can also follow me on Pinterest and Facebook. Join our facebook group Our Crochet Journey and be a part of our community. Share, photos, ask for help and be inspired all in one place! Written pattern, tutorials, graphs and pdfs of the March Texture Madness are copyright Windingroadcrochet.com. Please do not reprint or repost this content as your own, but please feel free to share this link with others. You can find more information on sharing my work with others in the Terms and Conditions Page. Subscribe to our FREE Weekly Newsletter and be notified of new free crochet patterns and craft tutorials. Thank you for signing up! I look forward to crafting with you! Copyright © 2019 Winding Road Crochet . All rights reserved.